With the open children’s programme ART & KIDS our young visitors can explore our exhibitions with all their senses. It is available for free and can be started at any time during our opening hours. During Easter holidays we’re happy welcoming you to our regular opening hours. 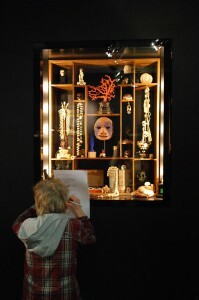 With the scavenger hunt the children can use their heightened senses to playfully get to know the artworks of our Wunderkammer and the current exhibitions. A lecture for children will take place on Wednesday, 17 April 2019 at noon with Claudia Opitz and Sebastian Köpcke on the occasion of the exhibition “ZOO MOCKBA – Toy Animals from the Soviet Union – 1950 to 1980”. The admission to the lecture is free.